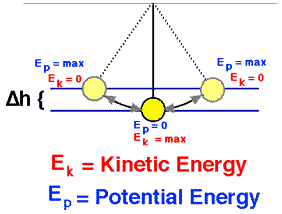 In classical mechanics, the gravitational potential energy (U) is energy an object possesses because of its position in a gravitational field. 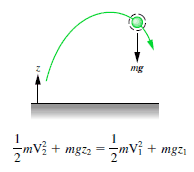 Gravitational potential (V; the gravitational energy per unit mass) at a location is equal to the work (energy transferred) per unit mass that would be needed to move the object from a fixed reference location to the location of the object. The most common use of gravitational potential energy is for an object near the surface of the Earth where the gravitational acceleration can be assumed to be constant at about 9.8 m/s2. The 1 kg block starts out a height H (let say 1 m) above the ground, with potential energy mgH and kinetic energy that is equal to 0. It slides to the ground (without friction) and arrives with no potential energy and kinetic energy K = ½ mv2. Calculate the velocity of the block on the ground and its kinetic energy.